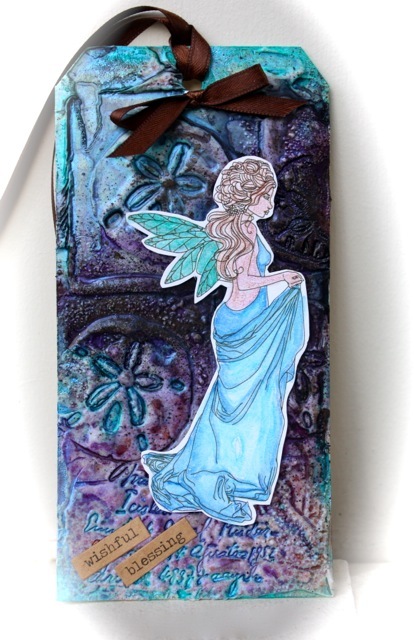 This beautiful stamp Waiting Fairy was designed by artist Kathy Cyr. I was inspired to try this image on a modeling paste debossed background by reviewing a tutorial by Norma Gomez. First let's discuss the image. She was colored using watercolor pencils, which were then blended using a water brush. To add glimmer to her wings, I used a clear Atyou Spica pen from Copic. Did you know Atyou Spica means "wow, stars?" She is mounted on the tag with dimensional tape so she really stands out! Now onto the background. I covered a Tim Holtz tag with Golden Modeling Paste (the regular type). I let it dry to a dull finish and then stamped into the modeling past with a stamp which has stamps on all six sides of various shells and text. I let the tag dry overnight and then used layers of mists to give it the shimmer. In drying the mists, I discovered the modeling paste would bubble a bit as it dried, which I actually like a lot. The mists I used are: Patina and Blitzen Glimmer Mist and Plain Jane Baseboard in Soil all by Tattered Angels. The wishful and blessing sentiments are from Tim Holtz. This is such a fun technique, I know I will try it again! Beautiful image and what a stunning background for her!! !